Janeth Vela, a junior, was one of the students invited to speak at the dinner. 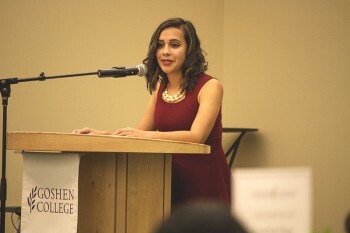 Goshen College hosted its first ever Latino Scholarship Dinner Tuesday night in the College Church Fellowship Hall. The goal of the dinner was to raise $50,000 for Latino students, and were able to come up very close to that goal, with around 160 people attending. Attendees included students, faculty and members of the greater Goshen-Elkhart community. The event also had a large number of speakers, including President James Brenneman; Janeth Vela, a junior; Rebecca Espinoza Kubacki, a former state representative; Edgar Saucedo-Davila, a GC alum; Alexa Valdez, a junior; Toby Faustino, a senior; and Isaac Torres, the founder and president of InterCambio Express in Elkhart. The dinner was also filled with music, by Lalo Cura. But, as people began to leave, a mariachi band from Fort Wayne marched into the hall. President Brenneman spoke on behalf of the college faculty about how Goshen College has worked intensively to be more welcoming to Latino students and students of color. Valdez, who spoke at the event, was pleased with how the dinner turned out. In a time when US politics are dominated by racism and oppression, Aguirre said that the dinner and the sentiments it implied gave him hope.